Most readers will be aware that New Zealand is currently in the midst of negotiating a free trade agreement (FTA) with the EU (without the UK). At the moment Europe is the largest trading partner, apart from the US, we don’t have an FTA with and about 15% of New Zealand’s exports of goods and services are with the EU. Talks around an FTA were announced back in October 2015 and finally began in ‘earnest’ this month. However, it is expected that they will take another 2-3 years to come to fruition. "1. An FTA that promotes adherence to environmental and labour standards, better living conditions for New Zealanders and sustainable and progressive economic growth. "2. An FTA with Europe that reduces the costs our businesses face at the border by removing tariffs (import duties) and other barriers. "3. An FTA that will level the playing field with countries that currently pay less due to existing free trade agreements with the EU. "4. An agreement that lowers costs for consumers, making things like food and consumer goods cheaper for New Zealanders. "5. We want to ensure this FTA works for companies of all sizes, big and small." Most would have no problem with these, however for some producers, and therefore this includes a major sector of New Zealand’s exporters point 4. did have me wondering. The only way that an FTA allows New Zealanders to have cheaper foods is by allowing cheaper imports from there back into New Zealand. It can be argued that if they allow us to export cheese wines and meats into their markets then we have to allow them the same courtesy. All fair and good. However, if they can produce cheaper than New Zealand then I would be interested to see how. Already we see increasing amounts of cheeses coming in from EU countries such as Bulgaria and France and much of the pork we consume now comes from Denmark, (it’s moved on from Canada). This is in the face of struggling pork farmers here constrained by environmental and welfare constraints and a smaller market to spread product among. Currently the EU spends around €50 bln on the Common Agricultural Policy (CAP). The primary roles of this money are to support farmers incomes and improve the environmental impacts of agriculture. The amounts farmers receive range from about €16,000 to €35,000 in Northern Europe down to around €8,000 in the South. While it is generally recognised as most (not all) of the CAP subsidies are de-coupled from production and therefore cannot be blamed from creating product surpluses, the same cannot be said about the pressures for achieving economic returns for the product produced. I can still recall during the lean times of the 1980’s selling firewood to try and make ends meet and being undercut by those (understandably) who on the dole were making extra cash by selling firewood. A similar principle is at play here. EU farmers may not produce more but they can sell afford to sell at lower prices. Current tariffs New Zealand has to pay which may get negotiated down are; (2016 figures) fish (an average 12.5%); honey (17.3%); kiwifruit (8.8%, a dollar value of nearly $25m); sparkling wine ($60 per 100 litres); apples (10.4% at the times of the year they are allowed to sell); beef (20%). 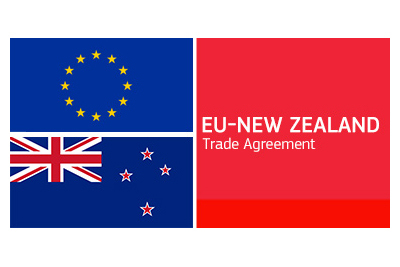 In the meantime, many of New Zealand’s trading competitors already have free access to the EU such as; Chile and kiwifruit, South Korea and tomatoes, Argentina and sparkling wine, Turkey and honey, Canada and beef. New Zealand due to its historical links with the UK has good access for lamb meat with quotas that are only being 75% filled. Beef and dairy are a different matter. Locally EU dairy products are allowed into New Zealand with a 0% to 5% tariff on most products, the big one for consumers is cheese and that is one of the 0%s. Conversely tariffs on New Zealand dairy products are so high it is definitely uneconomic to export into the EU. So, at a national level the government and certainly the large milk processing companies will be keen to get the FTA signed as there are some real gains to be made. However, as I am a small artisan cheese producer and lamb breeder there is absolutely nothing in it for me. Given the big stakes at play for large exporters, small domestic producers will potentially be collateral damage - a sad by-line of a successful negotiation. However, on the side of the small folk, (me), we have the European farmer. Given the EU is a major exporter of dairy products and having lost the €8 bln Russian market as a result of the Crimean annexing in 2014 even more dairy products are looking for a home in further parts, notably China, what chance do the New Zealand negotiators have of securing a meaningful deal? So sorry Fonterra but the small fellows may have a chance of survival with our EU allies. An interesting position to be in as I’m normally very parochial. On a sad note one stalwart in the North Island who has spent a considerable period of her latter years battling with MPI over the protocols small artisan cheese makers need to adhere to was Biddy Fraser-Davies. She came into prominence after appearing on Country Calendar as a result of winning a national cheese award from her two cows’ milk. Unfortunately, (for her) someone from MPI was watching and within a few days she received a letter advising her she was “non-compliant” and there started her crusade. Unfortunately, Biddy passed away on Friday night from after suffering a severe stroke. She was 76 years of age.